A request that wraps multiple other requests, allowing multiple requests to be treated as a single request. Create a composite request from the supplied list of requests. Add requests to the supplied composite request. Check the set of requests for errors. 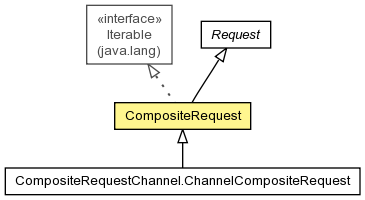 Return the unmodifiable requests contained in this composite request. Get the number of requests. Return a request that either wraps multiple requests, or the single request if only one is supplied. Create a composite request from the supplied list of requests. This is useful only for subclasses. Check the set of requests for errors. Calling this method will always result in the existing error being reset to a new error or null if there are no errors.